Chino Latino has 4 restaurants, London, Leeds, Cologne and Maid Marian way. Its not just the locations of this group that are a bit different, the pan-asian food on offer isn’t really comparable to anything you’ll find elsewhere in the city. Its an interesting set-up all round as the restaurant sits within the Park Plaza and is also known as a cocktail bar. Their decor is as exuberant as their drinks they serve too, strikingly black with bright red accents and low lighting. Menus consist of an a la carte (including lots of sushi and smaller dishes) and a tasting option. On my visit we decided to have the tasting menu for 2…for 3 as they only offer it for even numbers. Things kicked off with some attractive sushi, a Jurassic roll (which as far as I am aware is a term they have made up) that consisted of prawn & vegetables topped with mango. Prawn is so fresh and subtle it is easy overpowered and with the fruit the fish was often lost. Well prepared though and a good temperature, sushi rice shouldn’t be cold but it usually is. Softshell crab was next up and something I was looking forward to. The accompanying sauce was described by a friend as chip-shop curry, it was a little more suitable and fragrant than that but I understood his point. The crab itself was light though carried little flavour itself. A selection of dim sum had a crispy seabass gyoza where the finely chopped fish suffered against the crispy skin. The steamed dumplings were better than the fried, both sweet potato and lamb fillings had a much greater depth and spicing. The final starter bites were taquitos, little taco parcels filled with meat and fish. The beef wasn’t too discernible, tender but needing seasoning. Fish ones were better, a little like a cerviche with plenty of citrus cutting through the fresh fish. Mains begin in theatrical style with sizzling sirloin steak served atop hot rocks. Eat it quickly if you like it rarer, leave it on the rocks if you prefer it well done. A ponzu dressing was drizzled over, quite strong in acidity but it worked quite well, the beef well cooked and of good quality. Black cod with spicy miso was less successful, the fish had big translucent flakes but the sauce was very sweet, too sweet for me. Lamb cutlets marinated in Korean hot pepper paste with wasabi cream are as fierce as they sound. A fiery heat was balanced enough to allow the succulent lamb to hold its own. The main courses were served with jasmine rice, a nice foil to the flavours but nothing really had enough sauce to warrant much of it. 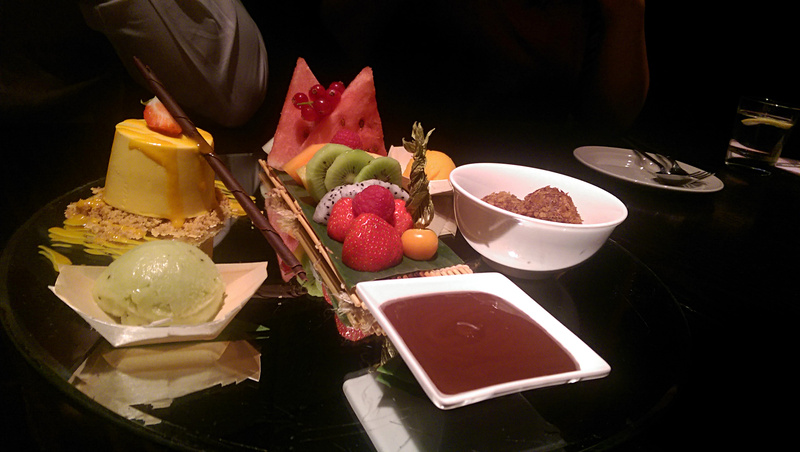 “Dessert Platter” remained a surprise until it arrived. Some deep-fried chocolate balls were nice enough, a little oily perhaps. A mango cheesecake suffered in flavour against the much more intense mango sorbet, the cheesecake base was also not quite right, too crumbly. There was also plenty of fruit with a little chocolate sauce, nice but not showing off much of the skill of the restaurant. As we managed to eat the tasting menu designed for 2 for 3 and had 25% off it ended up being rather excellent value. There was still plenty of food for £22.50 each. However at £45 per head at full price it seems rather expensive. The a la carte menu keeps up this high price point too with the average main course at £20. Whilst there were some excellent dishes what we had was a little too variable in quality to justify the usual menu price. Chino Latino is different enough though for it to be popular and successful amongst Nottingham’s dining scene.